2019 Thanks for lending a Paw! Thank you everyone - your contributions are greatly appreciated! Thank you so much for your donations Abby, they are much appreciated! 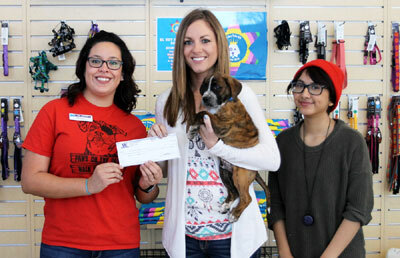 Thank you to the Camera Exchange for your donation, and for having your "Shoot to adoption" event at our shelter! 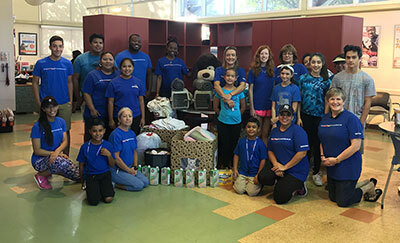 A big thank you to Neiman Marcus at The Shops at La Cantera for all of your donations! 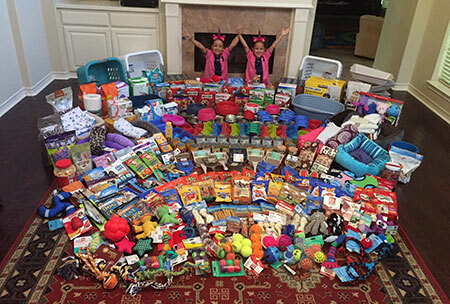 Jadyn and Justyce collected all these donations to our shelter pets for their 7th birthday. You are amazing, thank you so so much! 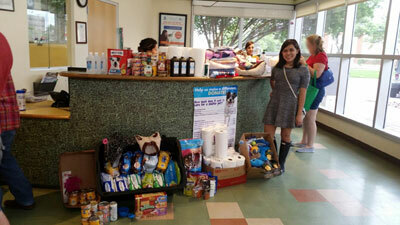 We really appreciate your donations - The Park on Wurzbach! 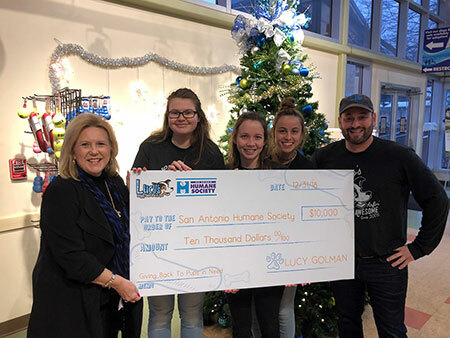 Thank you so much Lucy's Doggy Daycare and Spa for being one of our sponsors! Thank you US Storage Centers for your support! Thank you HEB, we appreciate all that you do for us. Thank you MR. W Fireworks for your donations, it's much appreciated. 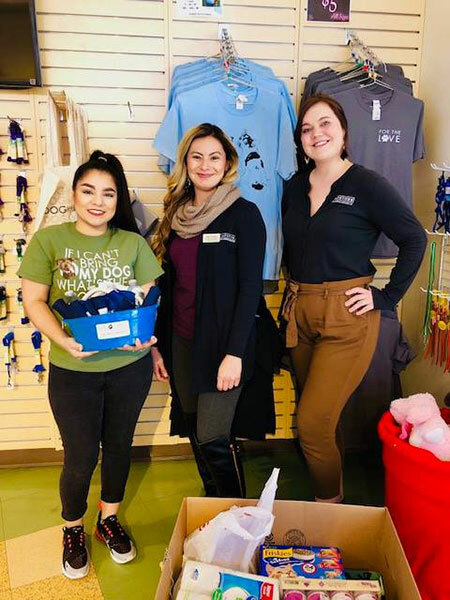 Thank you so much Pawderosa Ranch for everything you do for our shelter pets. A big thank you to Magnolia Pancake Haus for your support. We are happy to partner with Discover Carpet Care. They offer great services, especially for those with pets. 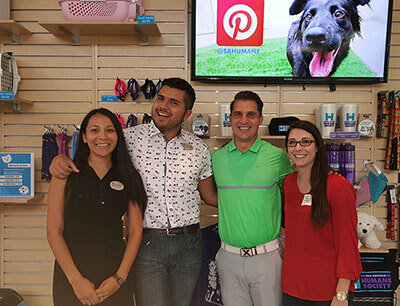 Mention the San Antonio Humane Society to receive a 10% discount. Thanks so much to John at 360 Zone for creating a Virtual Tour of the SAHS. If a picture tells a thousand words, a Google 360° Virtual Tour will speak volumes about your business and all it has to offer. Let 360 Zone bring Google's street view inside your business! Thanks to The Camera Exchange for helping us out with video equipment used filming a SAHS shelter tour. 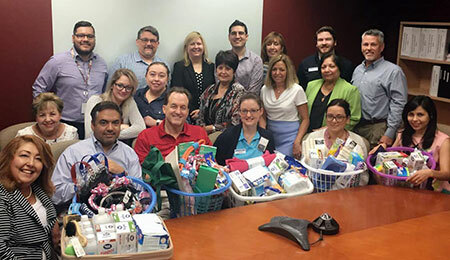 Thank you so much USAA for your donations! 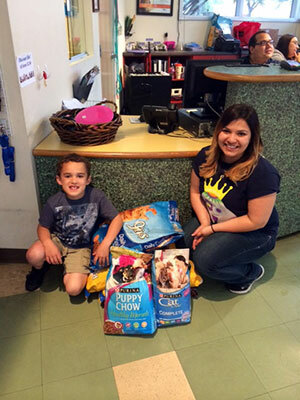 A big thank you to Scarlett and Maxwell for your donations! It's much appreciated. 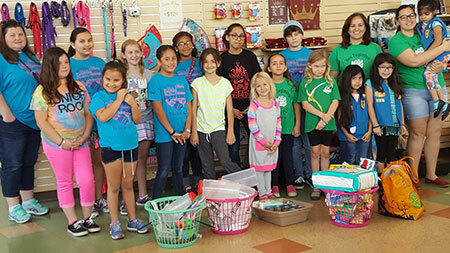 A big thanks to Girl Scout troop216 for your donations! 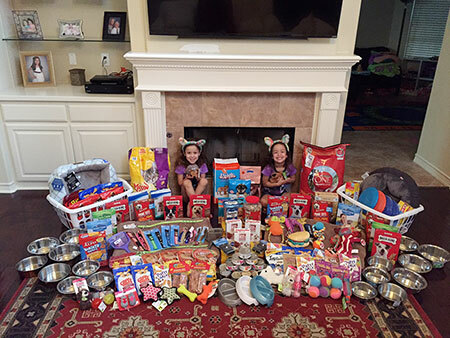 They used the profit from their cookie sells and bought supplies to help our shelter pets! They also made their own dog toys for our dogs! 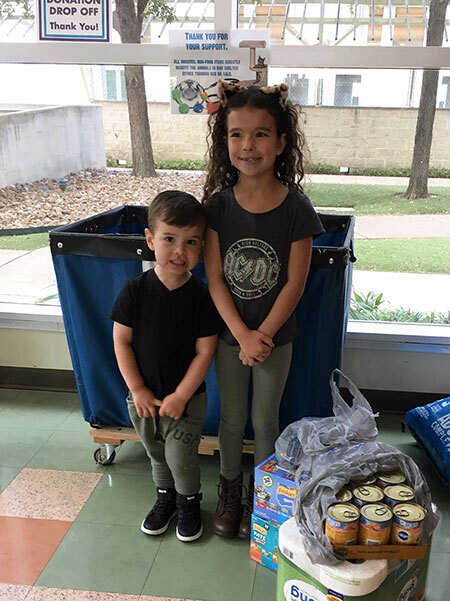 Instead of asking for presents on their 6th birthday, Jayden and Justyce collected donations of food, toys, blankets, beds, and other supplies for the animals at the San Antonio Humane Society. 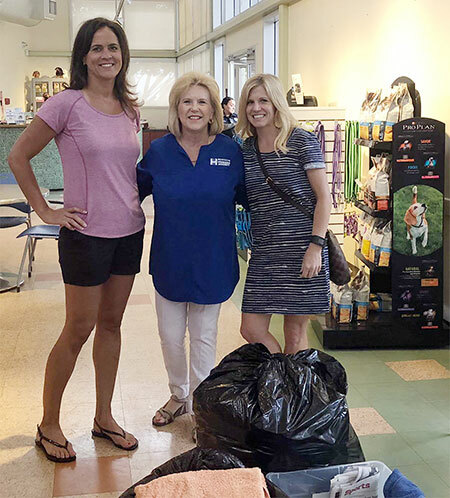 The other day the girls and their mom Sondra brought the donations to the shelter and got to hand-deliver a few of the toys to the puppies and cats. We can't thank you enough for your generosity girls! 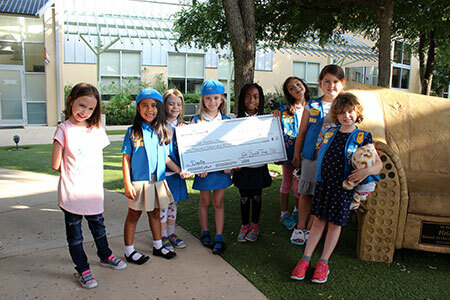 A big thank you to Girl Scout Troop 220 for donating $1000 to our shelter pets from selling Girl Scout Cookies! You are awesome! Thank you Bill Brown Elementary PTA for your towels and newspaper drive! 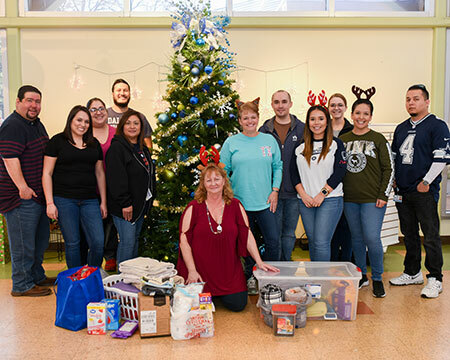 We appreciate all you've done for our pets in need! Thank you Neiman Marcus for all your donations, it's very much appreciated! Thank you so much Mr. Fireworks for all your support! A big thanks to Staples for helping us out with these donations, it's much appreciated! 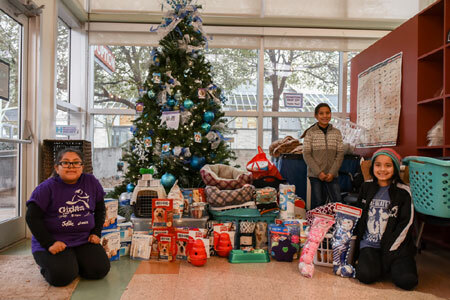 Thank you so much Stacia (pink jacket holding the leopard print blanket) for asking for supplies for our shelter pets instead of birthday gifts! Jackie Klein and her two dogs, Brinley and Daisy, so generously shipped four boxes of donations to us from Amazon.com. 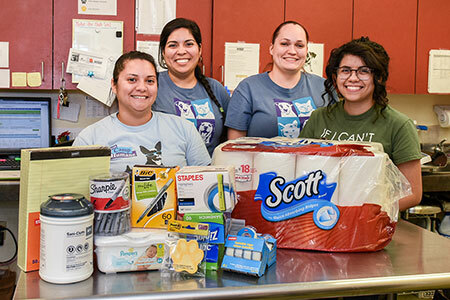 She said she selected everything off of our "urgent" list, including the grooming table and grooming clippers (Joey a volunteer pet groomer here at the SAHS is ready to use it). Colby Jones is a John Marshall High School Student who's taking a Community Service course this semester. As part of his class project, he chose the SAHS as his focus. 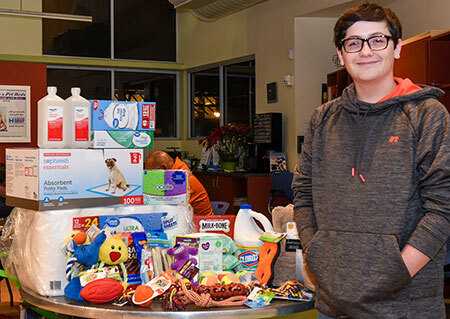 He setup a donation drive at his school and collected all of these awesome items. Yay! 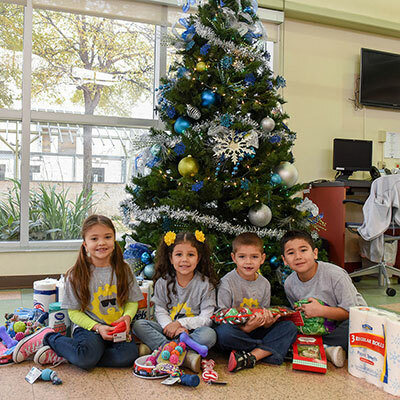 Thank you to the San Antonio Academy, 1st graders, for all your donations and taking our tour of the shelter! Thank you so much Wilson Elementary Running Club for all of your donations! You are amazing! 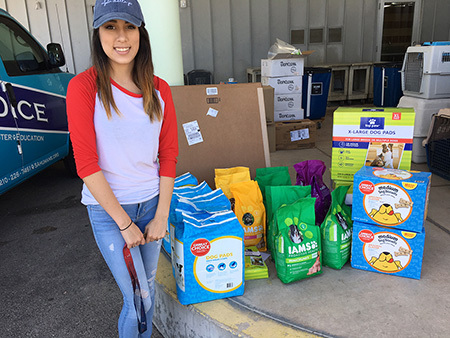 A big thank you to Brenda Gutierrez, a UTSA - The University of Texas at San Antonio student from Fort Worth, for all your donations! You are awesome! 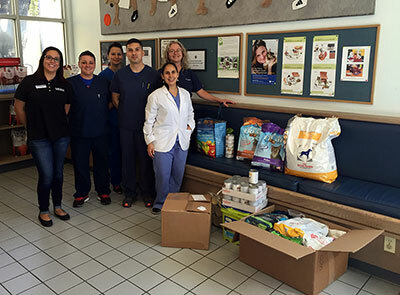 We were visited by American Ninja Warrior finalist Kacy Catanzaro, and she generously donated items to our pets! 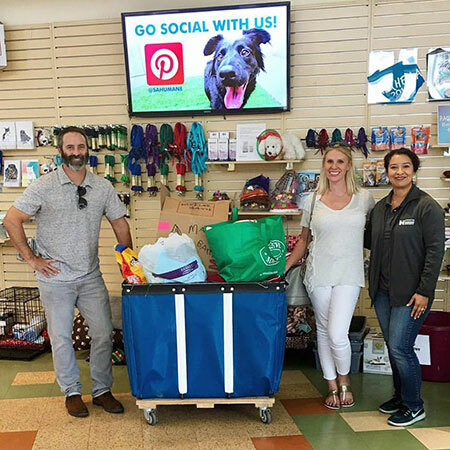 Kacy and her boyfriend, Dave, recently lost their fur-baby, Mr. Mogley, and have since been spreading love to animal shelters by donating in his memory. She even has Mr. Mogley's face on her apparel! 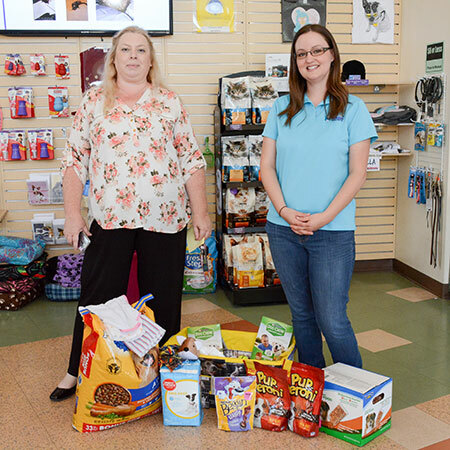 Thank you, Kacy, for giving to pets all around! Thank you so much Whataburgers Legal Department for all your donations! A big thank you to Ellis Insurance Agency for your donations! 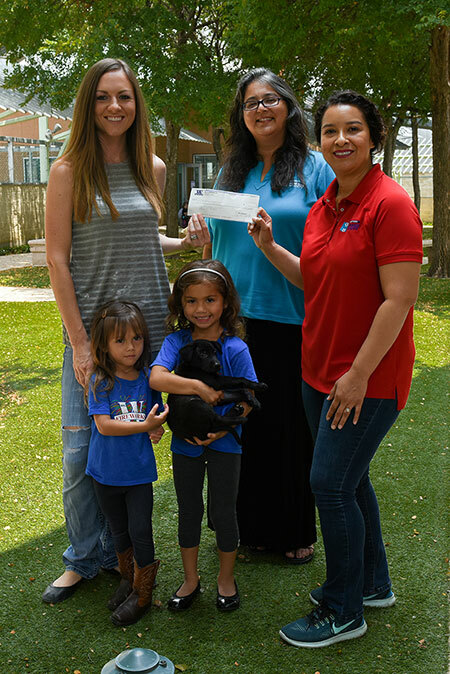 Thanks so much to the Business Professionals of San Antonio, who raised $536.75 for our shelter pets last night at their August Networking Mixer! Thanks so much to Mr. W Fireworks for the generous donation. Our pets appreciate the support! Thank you so much Michelle for all the donations! 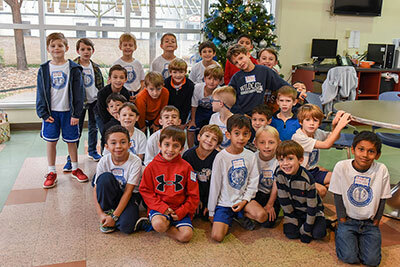 A big thanks to Concordia Lutheran School for your donations and visit! 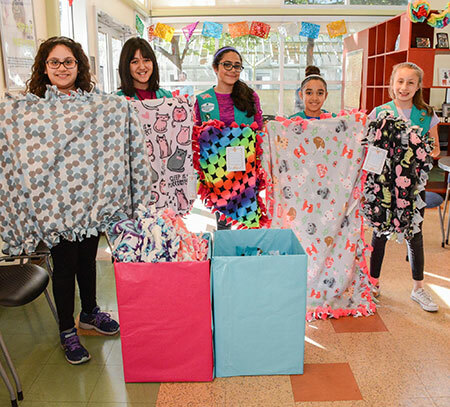 Thank you so much for the beds Girl Scout Troop 3113! It's much appreciated! 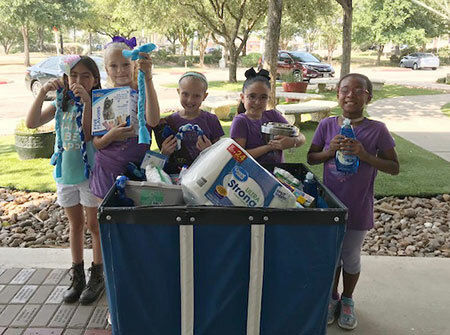 Thank you so much Girl Scouts Troop 605 for taking our tour and for all of your donations, especially supplies that went to immediate use for our Foster Program. 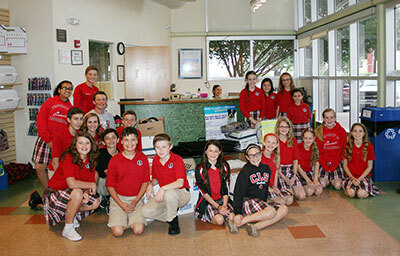 Thanks so much St. Thomas Episcopal School for your donations! Thank you so much Emma for the blankets and beds for our pets! Emma made these for her NJHS project! A big thank you to the Montesorri School of San Antonio for everything you donated to the us, it's much appreciated! Thank you Girl Scouts (298) for coming out for your "Do You Know What Happens at an Animal Shelter?" project, and thank you so much for the treats, towels, and hand-made rope toys! 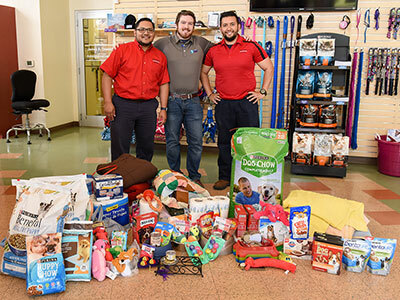 Believing every animal deserves to be warm and sleep in a bed while they wait for their forever family, Mission Veterinary Specialists created an outlet for others to help. The 2016 Give a Blanket. Change a Life. 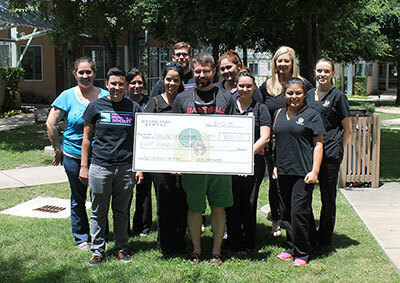 campaign was the 4th annual and we are so excited to again, be a recipient of donations! Give a Blanket. 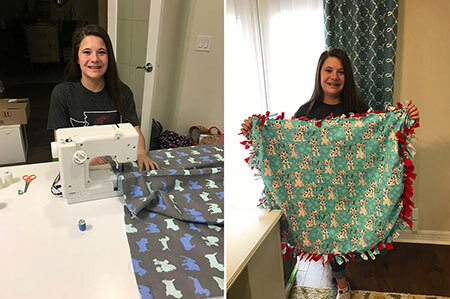 Change a Life has blossomed into a campaign that involves not only local veterinarians and their practices, but also corporate offices, schools and pet-loving families! Branded boxes are delivered to each campaign partner for easy collection of new or gently used blankets, pet beds, sheets and comforters. 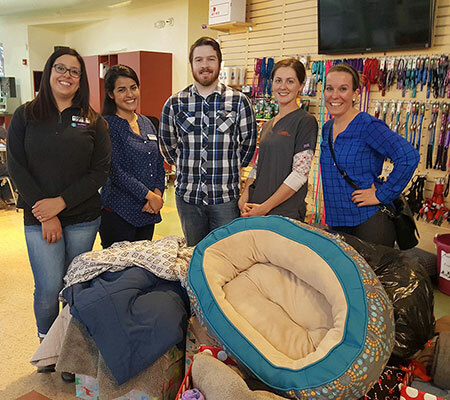 In 2016, this 5 week campaign allowed over 300 pet beds and blankets to be donated to local area shelters, including the SAHS, where they will make an immediate impact. 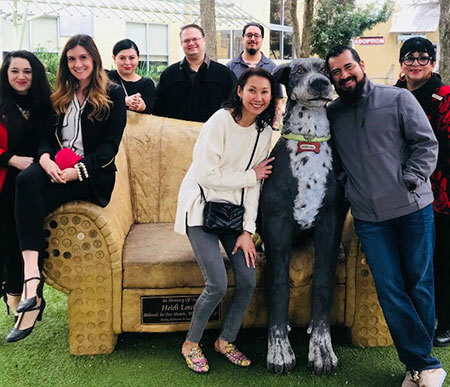 This effort has allowed MissionVet to accomplish their goal of warming the homeless pets of San Antonio, but even more, has granted them an outlet to the community that showcases the true heart of their hospital – compassion, teamwork and love for the city we all live in! We were happy to partner with Mr. W Fireworks this past New Year, as they assisted us in sharing the importance of pet safety during the holiday. They have been a great supporter of ours and we would like to recognize their kind $2,000 donation. Thank you Mr. W Fireworks! We want to give a big thank you to Jadyn and Justyce, they celebrated their 5th birthday on January 6th. 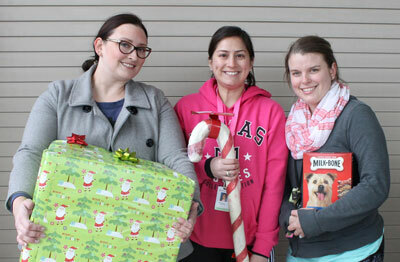 This year instead of receiving gifts for themselves they decided to take donations for the San Antonio Humane Society. You girls are awesome!!! 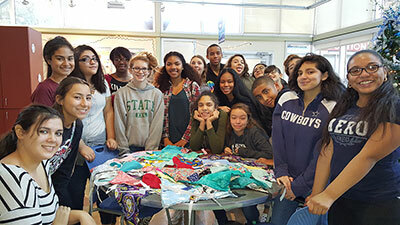 Thanks to Jordan Middle School Family Consumer Science class for all the wonderful bandanas! 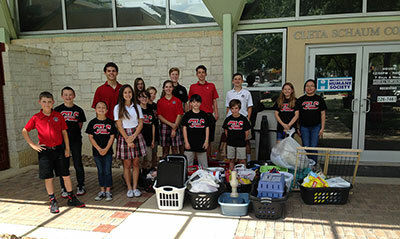 Thank you so much San Antonio Academy for all your donations and for visiting us! A big thank you to Sally Smith's K-2 for coming by with your donations! You guys are awesome! 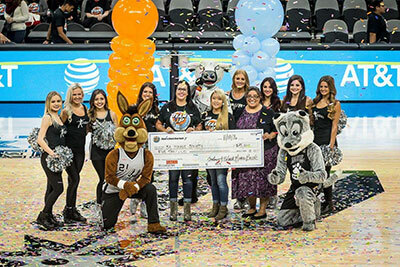 Thank you so much Silver & Black Give Back! 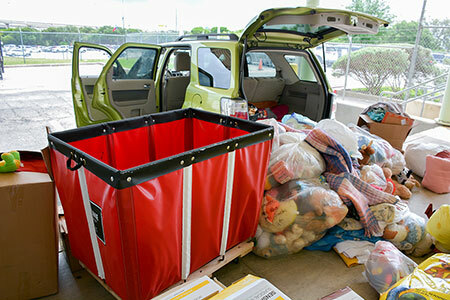 A big thanks to Toyota Motor Manufacturing Texas, Toyota USA and to TODOS for your donations! It's much appreciated! 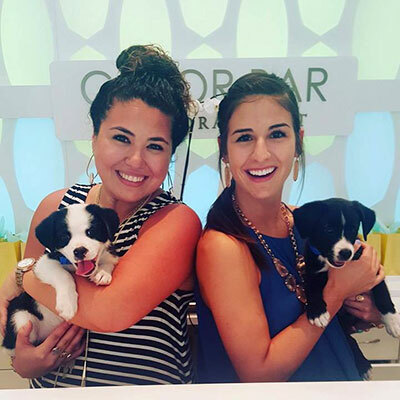 Thank you so much Kendra Scott Quarry Village - San Antonio for hosting Kendra Gives Back benefiting our shelter pets! You're awesome! 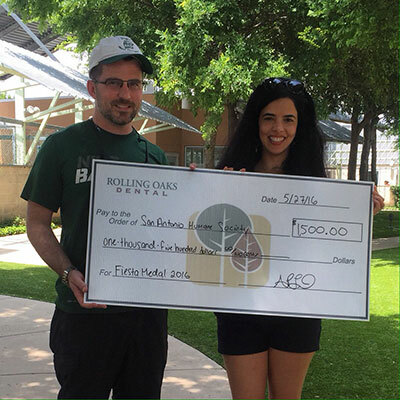 Thank you so much for your support Rolling Oaks Dental, it's much appreciated! A big thanks to Concordia Lutheran Church for their donations! Thank you so much Girl Scout Troop 369 for all your donations! 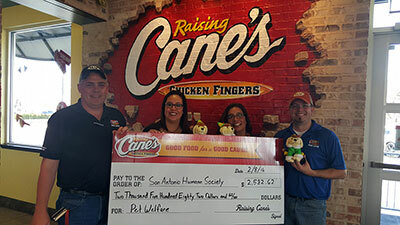 A big thanks to various Raising Cane's locations in San Antonio for your generous donation! 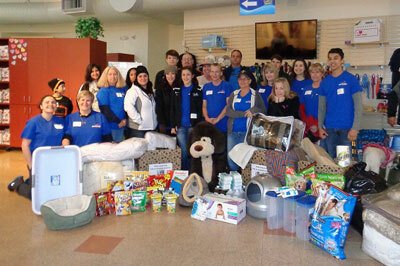 Thanks so much to SouthWest Airlines for your time and donations! 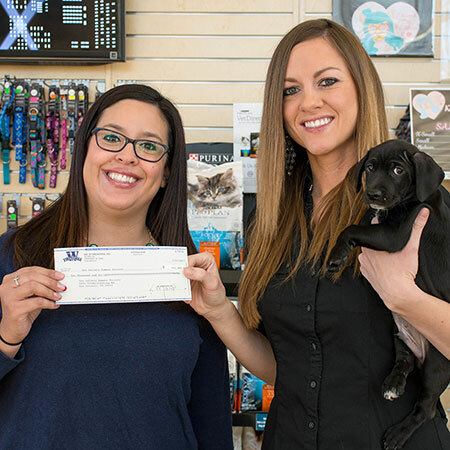 Thank you to Mr. W Fireworks for donating $2,000 of their proceeds to our pets and for helping us raise awareness during the New Year! 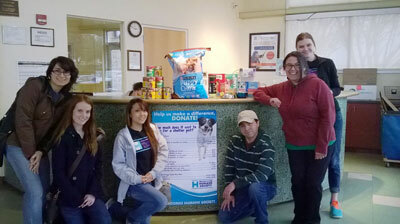 A big thanks to Affordable Pet Care Ingram Park (Ingram Park Animal Hospital) for your donations! 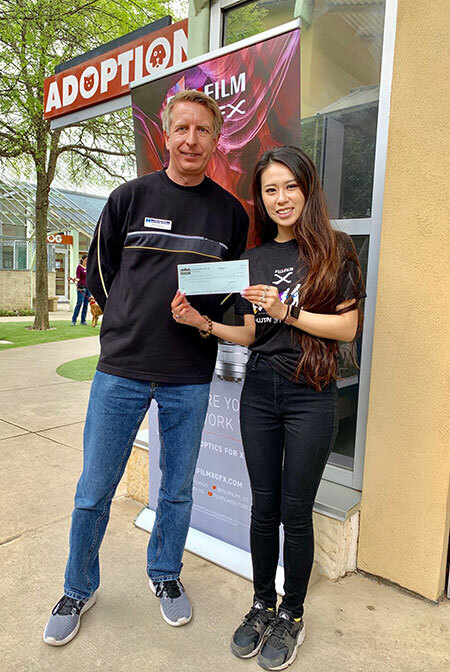 A big thanks to Hyatt Regency Hill Country Resort and Spa​ for your donation! 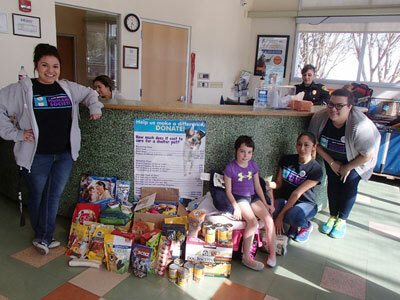 A big thanks to Teresa and Marcela for the huge donation to help our furry friends! You guys are awesome! 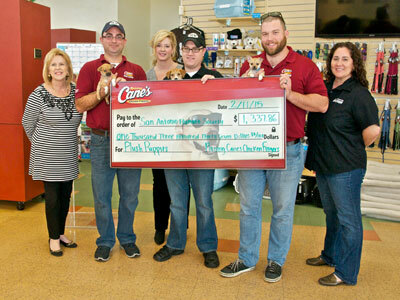 A huge thanks to Raising Cane's for your generous donation! It's much appreciated! Visit them at their new 8007 Fredericksburg Rd location! 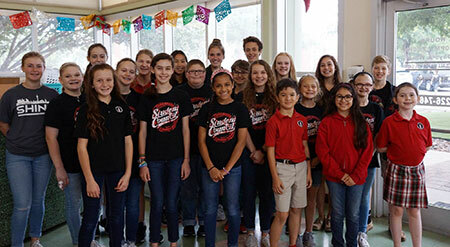 Rolling Oaks Dental sold Fiesta medals benefiting the SAHS! You guys are awesome, thank you so much! 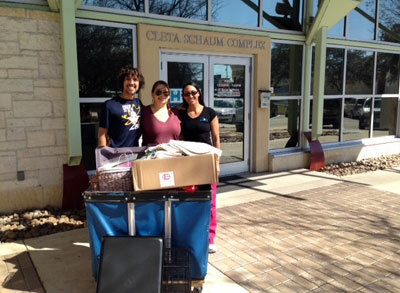 A big thanks to the Medical Surgical ICU/Medical ICU team at Methodist Hospital on Floyd Curl Dr. for your donations! It's very much appreciated! 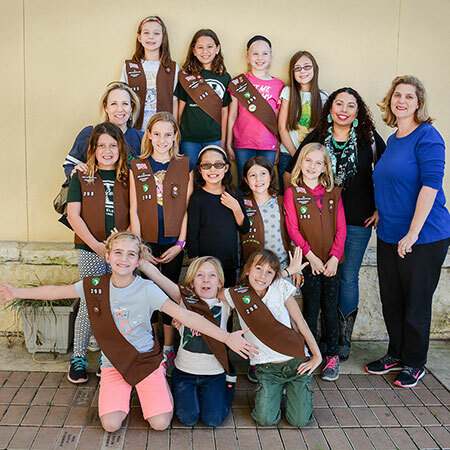 Thank you so much Brownie Troop #448 for your donations! 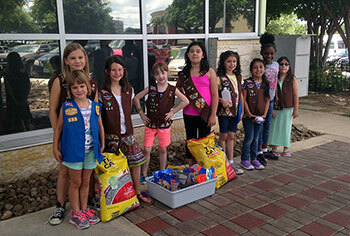 Brownie Troop #448 picked the SA Humane Society as their Spring Community Service Project. 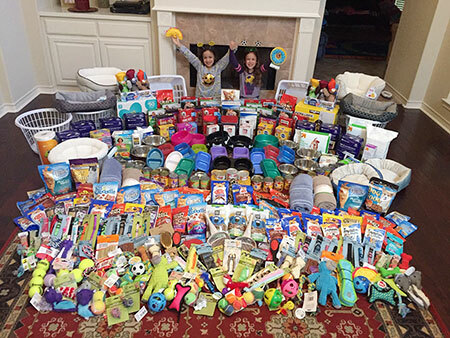 The girls used some of the money that they earned from selling Girl Scout Cookies to go to PetSmart & purchase items off of our wish list. 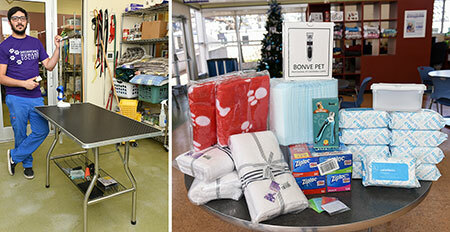 They visited the shelter this weekend & brought the items that they purchased to donate! 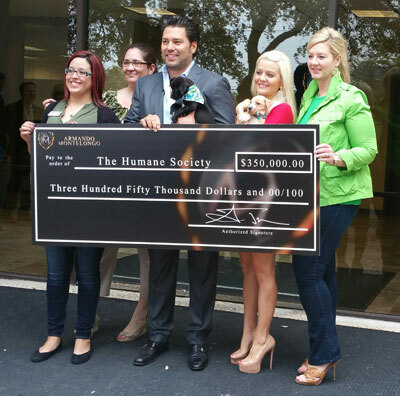 The San Antonio Humane Society welcomes new partner, Ken Batchelor Cadillac. Volunteers from Ken Batchelor came out in force on Sunday afternoon to assist with bathing dogs, socializing the animals and some not so fun but definitely necessary scanning of our back field. They helped clear the field of pet waste. These team members didn't blink an eye when asked to complete this task. We were thrilled to have this team join us for the afternoon. They were gung ho and ready to go! 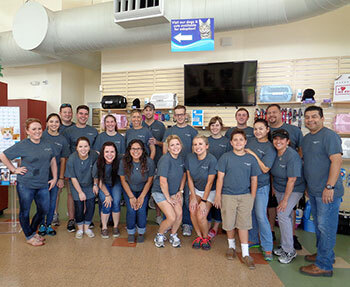 Our friends and partners at SW Airlines came out to participate in our Volunteer for a Day event Saturday, May 30th. These volunteers walked dogs, socialized puppies and kittens and also helped with bathing our older dogs. New to the event was an educational piece for children of SW Airline volunteers. 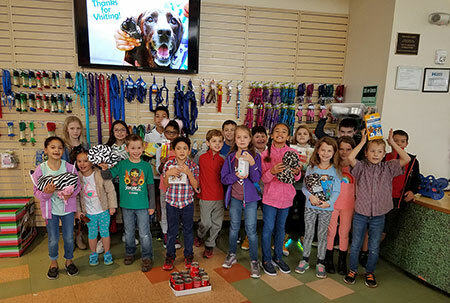 We had 5 students that toured the facility, made dog toys and learned about responsible pet ownership. Thank you Southwest Airlines!!! 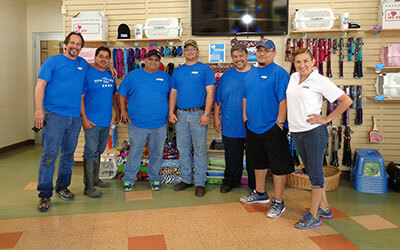 A group of 7 Equipment Depot employees came out to participate in Volunteer for a Day at the SAHS. The employees power washed sidewalks, put together crates, socialized animals and restocked items. They rocked the day! A huge thanks goes out to everyone who participated. 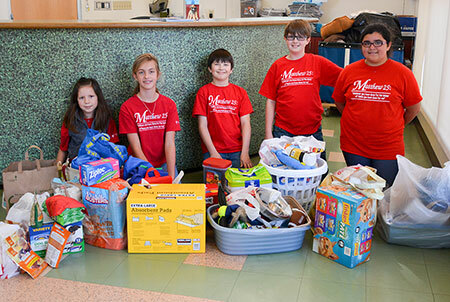 Thank you to the Student Council members of Concordia Lutheran School for all of the donations! We want to say Thank You so much to Garett Martin. You are awesome!!! 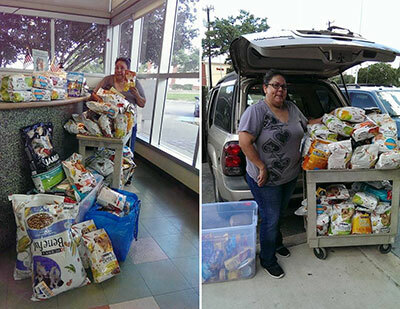 "For his 7th birthday he asked friends and family to bring dog and cat food in lieu of toys so that he could donate them to the San Antonio Humane Society. Afterwards, he walked around to meet all the beautiful animals and he fell in love with Vladimir and Victor. He was so happy that the cuties were being adopted. He left with a huge smile on his face and has influenced other family members to donate as well." Claudia is one of our volunteers who had a project and decided she wanted to help us out even more. 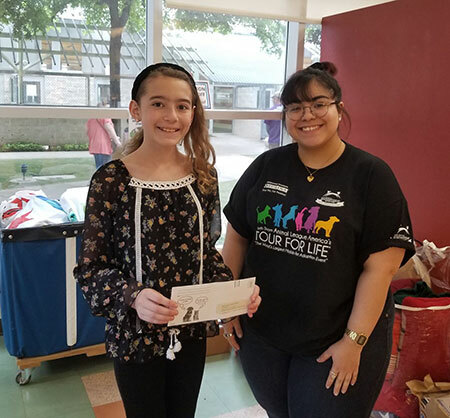 She had donation drive at her school (Louis D. Brandeis High School) and collected dog/cat food, paper towels, and toys as well. Thank you so much! 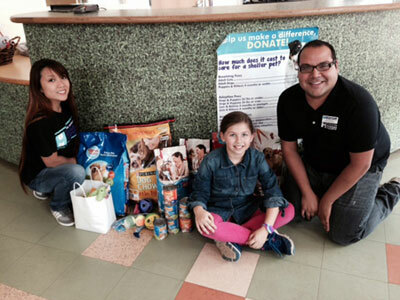 Faith asked for donations for the San Antonio Humane Society for her 7th birthday. You're awesome Faith!!! Thank you so much! 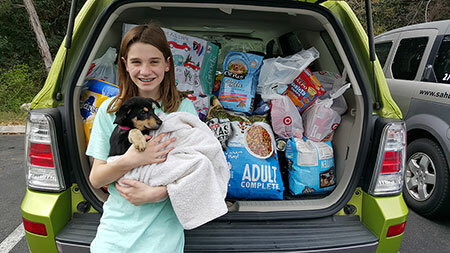 Instead of accepting birthday gifts, Eloise asked friends and family to bring pet food, toys, and treats so she could donate to us! She also brought over $100! Thank you so much Eloise, you rock!!! 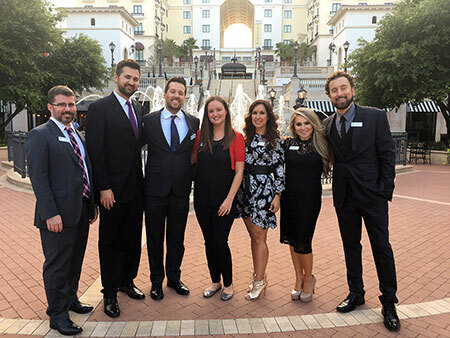 San Antonio real estate investor, Armando Montelongo, committed to donate a total of more than $1 million Tuesday (March 17, 2015), divided among three nonprofit organizations...the Wounded Warrior Project, Make-A-Wish of Central & South Texas, and the San Antonio Humane Society. Each charity will receive a total of $350,000, to be disbursed over a 20-year period, which will contribute $17,500 in annual support to each of the three benefiting agencies. 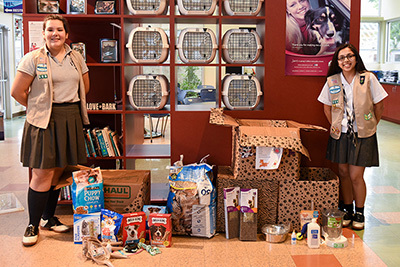 The SAHS is extremely grateful for this generous donation, which will help shelter and care for thousands of cats and dogs and will essentially impact our sustainability for many years to come. Thank you Armando Montelongo for your incredible donation! Montelongo states, “I feel very blessed to be in a position where both life and business are centered and successful. 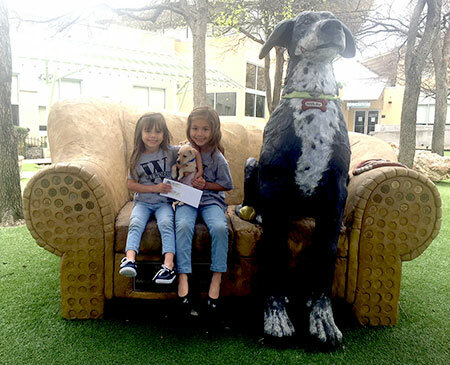 I feel it is imperative to give back to the community that has given me so much.” Avery just turned 6 years old recently (Happy Belated Birthday) and instead of asking for gifts she asked her friends for donations to the San Antonio Humane Society! 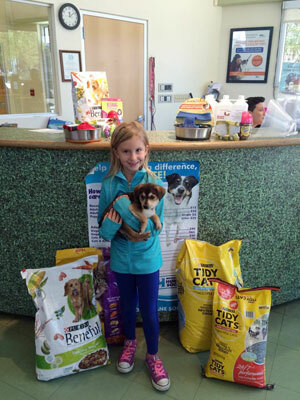 You are awesome Avery, thank you so much for your passion for animals and for helping out our shelter pets! You're an inspiration! 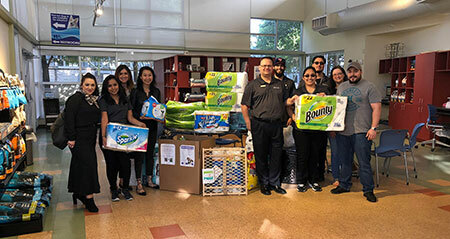 A big thanks to SIL (Students In Leadership) at UTSA for all your donations! It's much appreciated! 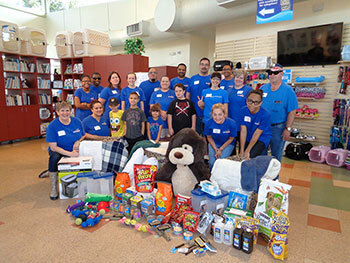 Thank you so much Southwest Airlines for your donations and taking part in our Volunteer for a Day program. 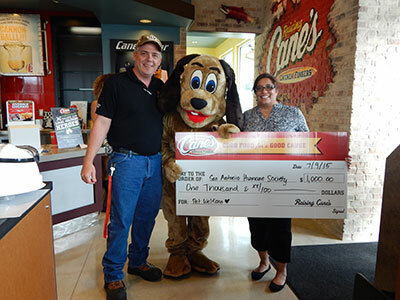 A huge thank you to Raising Cane's for your continued support of the SAHS! Your donation to help our shelter pets is much appreciated! Thank you so much Loka Studios for your donations! The towels, blankets, toys, food, treats and more is much appreciated! 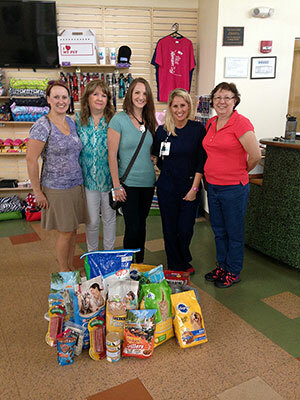 A big thank you to Healthways for all your donations, 3 car loads full of treats, toys, beds, litter and much more!! You guys are awesome!